The Sopwith Triplane was the first of it's type to see service during WWI. It was flown by several squadrons but perhaps most famously by No 10 Naval Squadron. 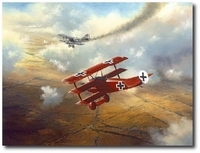 During the months from May to July of 1917, "B" or "Black" Flight of No 10 Naval Squadron accounted for 87 enemy aircraft shot down. 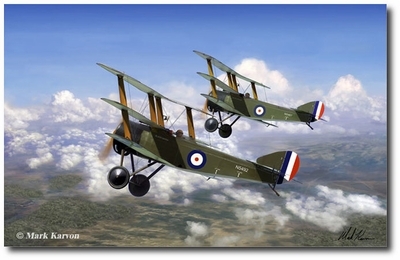 Mark's print depicts the Sopwith Triplanes of Ray Collishaw and W M Alexander - 10 Naval Squadron; "Black Flight". Note: The a copyright watermark is not present on the actual print. Prints are signed by the artist and feature an extra 1" border to allow for matting and framing.